Synopsis: A Diabolic is ruthless. A Diabolic is powerful. A Diabolic has a single task: Kill in order to protect the person you’ve been created for. The Diabolic is the story of Nemesis. A Diabolic. An engineered bodyguard – strong, fierce, deadly. Diabolics are engineered to be ruthless, have no emotions and a killer instinct. And from the moment that Nemesis is bonded to Sidonia, a young galactic heir, there is nothing Nemesis wouldn’t do to protect her. She protects Sidonia from any threat, including the ever-increasing threat from the Emperor, so when Sidonia is summoned to the Galactic Court, Nemesis goes in her place. Unable to feel or understand human emotions, Nemesis must pretend to be Sidonia in a world filled of back-stabbing and hierarchy. She must do everything she can do go undetected, otherwise her life as well as Sidonia’s life is in grave danger. And this is where the struggles of understanding and feeling human emotion start to cross over. The ongoing debate regarding a Diabolic’s capacity to feel human emotion is ongoing through the book, as well with Nemesis herself. As the story develops she struggles with her conflicting feelings of loyalty and friendship, love and protection, self-preservation and revenge. I loved this story coming from Nemesis’ point of view. A humanoid struggling to understand the undercurrent of emotions running through her – emotions that no Diabolic should ever experience. This did lead to some rather rash decisions or opinions, some of which were wrong, and while one rash decisoin in particular did annoy me to no end, it goes to show that sometimes human emotion is the exact thing that leads us to the truth. For me, there was nothing wrong with this book that another 100 pages or so couldn’t have rectified. I am a big fan of world and character building, and at times there just wasn’t enough fleshed out for me to be completely satisfied. There were some really great parts in this book that focused on character development, but for me it just wasn’t quite enough to allow this book to blow me away. This book includes other aspects of the storyline that weren’t fleshed out enough either, including of faith vs science, the politics, and the ethics. But that is just my personal taste, so while I like exploring the ins and the outs of everything, others will really enjoying having an overview of certain things without being bogged down in details. But in saying all of this, on the sci-fi side of things, this book had just the right amount! I am not the biggest of sci-fi fans, especially galactic sci-fi, but I found that the author balanced the right amount of details without me feeling that it was too “unreal” (for some reason galactic stories are just that step too far for me, I don’t know why). But I really enjoyed the sci-fi aspect of The Diabolic, everything from the zero gravity dancing to the medical advancements, but the real winner here is the genetically engineered creatures! While totally tortuous and completely inhumane (and often murderous and violent), these creatures are fascinating from both a sci-fi and emotional point of view. Overall, this is a sold standalone novel. A ruthless killer and human emotions collide in this unique and fresh addition to the YA market. 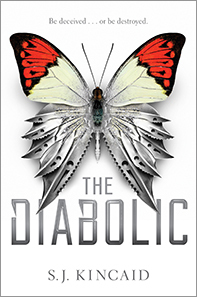 Filled with politics and love, devotion and deceit, violence and heart, The Diabolic is an exciting read filled with fascination, twists and a whole lot of human emotion! Also, don’t forget to check out the Book Nerd Reviews stop on the Australian The Diabolic Blog tour! Here you can find a guest post from S.J. Kincaid. And win a signed copy!